It’s a challenge to create a super-premium audio system capable of both shocking volume and outstanding sonic quality. Design that system and then mount it on the most desirable factory-custom bagger ever built, and you’ve got the 2015 CVO™ Street Glide™ model. Twelve speakers. Two 300-watt four-channel amplifiers. Unique static and dynamic equalizers and a sophisticated midrange DPS cross-over to give music greater clarity and a more natural sound at all volume levels. Tunes from The Strypes to Shania Twain may sound better than you’ve ever heard before. 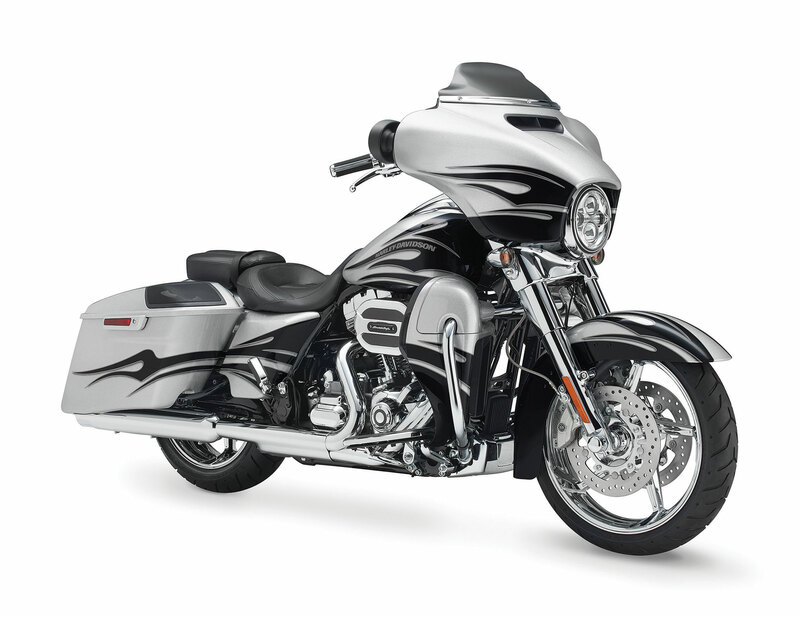 The CVO team has turned the entire Street Glide up to 10. Custom features include polished Aggressor custom wheels, extended saddlebags, Airflow Collection accessories from hand grips to muffler caps, a custom CVO™ seat, Daymaker™ LED headlamp and Wind Splitter windscreen. This plus all the Project RUSHMORE features, including an iconic Batwing fairing with Splitstream vent to reduce head buffeting and the Boom! Box 6.5GT infotainment system with Touchscreen and GPS. Top it off with an intricate paint scheme and the added exclusivity of four color options. But wait…there’s more! Offered for the first time in a Street Glide, the Screamin’ Eagle Twin-Cooled™ Twin Cam 110™ powertrain pumps out a stout 115 ft. lbs. of torque to really move this bike down the road. A side-fill fuel tank is topped with a new slammed console with illuminated CVO logo. Other custom features include new five-spoke polished chrome Aggressor custom wheels, extended saddlebags, Airflow Collection accessories from hand grips to muffler caps, a custom CVO seat, Daymaker™ LED headlamp and Wind Splitter windscreen. This, plus all the standard Project RUSHMORE features, including an iconic Batwing fairing with splitstream vent to reduce head buffeting and the Boom! ™ Box 6.5GT infotainment system with touch screen and GPS. Top it off with an intricate paint scheme and the added exclusivity of four color options: Scorching Yellow/Starfire Black Flames, Starfire Black/Gold Dust Flames, Ultraviolet Blue/Molten Lava Flames and Hard Candy Mercury/Smoky Quartz Flames. Feast your eyes on the Twin Cam 110™ engine and there’s no mistaking its roots. This is authentic Harley-Davidson style through and through with an attention to detail you won’t find from any other motorcycle company. It’s a jewel machined out of metal. Pure. Dripping with power. From the classic edge of the cooling fins to the clean lines of cases and covers—the Twin Cam 110™ engine makes an ironclad statement about holding on to what’s right and staying true to what satisfies. If you started in 1909 with the very first Harley-Davidson V-Twin engine and worked your way up through every engine, every innovation, every improvement, every ride, every durability test in all those years and countless miles since, you arrive at the Twin-Cooled™ Twin Cam 110™ engine. This is the top of the line. 110 cubic inches of air and precision cooled Harley-Davidson® V-Twin. Twin cooling cools the heads around the exhaust ports to deliver at or near peak performance under all operating conditions and temperatures. Higher compression ratio increases efficiency and horsepower. There’s a new airbox for increased airflow and a new cam to optimize low-end torque. On top of all that, it puts less heat on the rider and passenger on scorching days and in stop and go traffic. Fire up the Twin Cam 110™ engine and feel the low-end torque unleashed. Thanks to the lightweight piston design, delivery of the added power is more refined than ever. Ease out the rock-solid hydraulic clutch and feel how the engine and Six-Speed Cruise Drive® transmission were designed to work together. Six speeds. A strong driveline and strong internal parts. Low routine maintenance. And a low cruising rpm couldn’t feel better. The knowledge of what makes an engine truly move a rider runs deep at The Motor Company, and it was put to good use when we created the Twin Cam 110™ engine. We painstakingly perfected every cubic inch, pushing design and technology forward—all without compromising one bit of Harley-Davidson’s unique styling. Evolved, yet carrying on the legacy of the Flathead, Knucklehead, Panhead, Shovelhead, Evolution®, Twin Cam 88® and Twin Cam 96™ engines that came before. The performance and durability are a direct result of the untold miles logged on the V-Twin since 1909 and the proud heritage that comes from a century’s worth of commitment to life on two wheels. Confidence. Control. High-performance dual disc Brembo® brakes offer consistent stopping power at all speeds. The 4-piston front and rear caliper with dual front rotor brake system is state of the art and top of the line. And there’s a specific caliper insert. It’s just another way The Motor Company puts a high level of detail into their bikes to give you peace of mind throughout your journey. For those who regard darkness as an invitation to go farther, the Daymaker™ LED headlight will light the way. With powerful, daylight-simulating lumens that bathe the dark road in natural light, a shoulder-to-shoulder spread and a punch that goes deep into the road ahead, the night is yours to take with full confidence. Because not all of us look for an exit when day turns to night. Hydraulic rear shocks with adjustable pre-load give you state-of-the-art function when it comes to dialing in your ride for lighter or heavier payloads, adjusting to unexpected road conditions or just tuning in the ride feel. It’s all about setting up your bike the way you like it. Fast. Easy. Simple. Big, clear sound for your stereo is what want and that’s what you get on the CVO™ Street Glide® motorcycle. It’s served up via new 6.5” BOOM! Stage II 3-way speakers in front. They make the sound coming at you as epic as the road ahead. We dialed in the comfort of our machines the hard way: over thousands of miles in all kinds of riding conditions on every kind of street, road and highway ever laid down in pavement. Experienced riders putting in long hours in the saddle and giving us feedback on every aspect that contributes to comfort on the road. Airflow, heat management, seat textures, legroom and hand controls all went under the hard microscope of the road and got tested and re-tested by real riders and worked and re-worked by us until we were satisfied we had built the most comfortable machines on the road. We all want to go farther, and when you’re more comfortable in the saddle, you can. Classic style and maximum comfort. 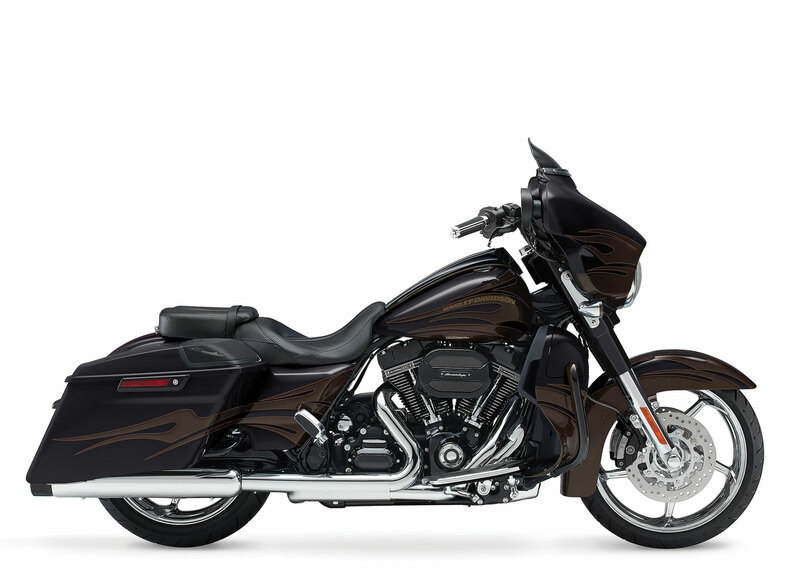 That’s the perfect balance of the wide set handlebars that come standard on the CVO™ Street Glide® model. They’re designed to keep you comfortably propped in a commanding position while making sure your neck muscles stay calm and relaxed mile after mile, state after state. Durable stainless steel ensures the structural rigidity you expect from a Harley-Davidson® motorcycle with the deep, lustrous finish you desire. 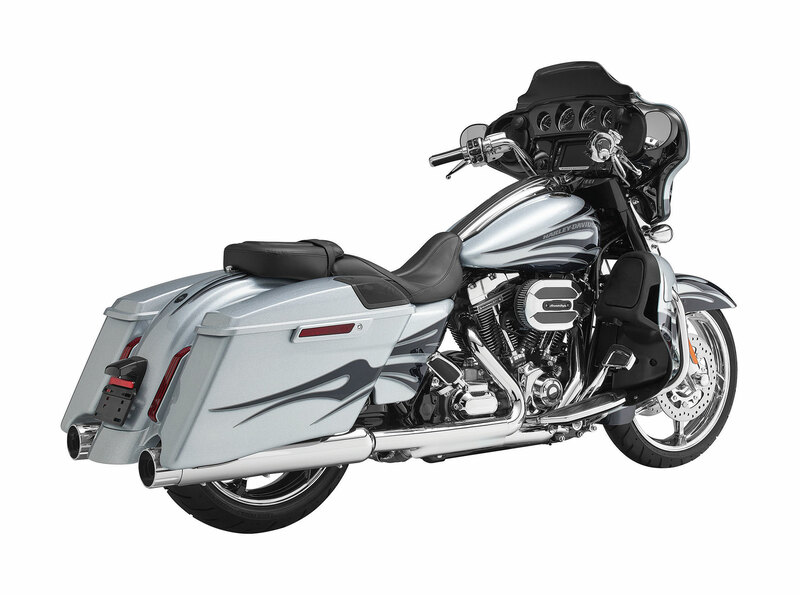 The CVO™ Street Glide® model features injection molded extended saddlebags. They not only give you full-on hot rod bagger style, they give you booming sound for your stereo thanks to integrated 5” x 7” BOOM!™ Stage II 3-way speakers. You also get carryout liners for getting your stuff from the parking lot to the motel, secure locks and easy one-hand operation. The CVO™ Street Glide® motorcycle rolls off the line with a full compliment of custom touches from the Airflow Collection: full-length floorboard with heel/toe gear shift, passenger foot pegs, grips, brake pedal pad and muffler end caps. You want more. More is what you get. Individually crafted and hand-finished paint and graphics come standard on all Harley-Davidson® Custom Vehicle Operations™ motorcycles, balancing style and premium appeal to create one-of-a-kind custom motorcycle masterpieces. The CVO™ Street Glide® model offers four exclusive color schemes: Scorching Yellow/Starfire Black Flames, Ultraviolet Blue/Molten Lava Flames, Hard Candy Mercury/Smoky Quartz Flames and Starfire Black/Gold Dust Flames. Skimping? The word’s simply not in our vocabulary. Part of the unmistakable style of the Harley-Davidson® CVO™ Street Glide® motorcycle is plenty of room for showing off your paint. This classically styled, bold six-gallon fuel tank doesn’t just give you a bigger canvas for premium or custom paint; it holds six gallons of go so you can eat up a lot more road between pit stops. We know fuel economy is important—but so is style. Sharp, eye-catching colors and precision-crafted Harley-Davidson® tank medallions complete the unique look of this tough bagger. 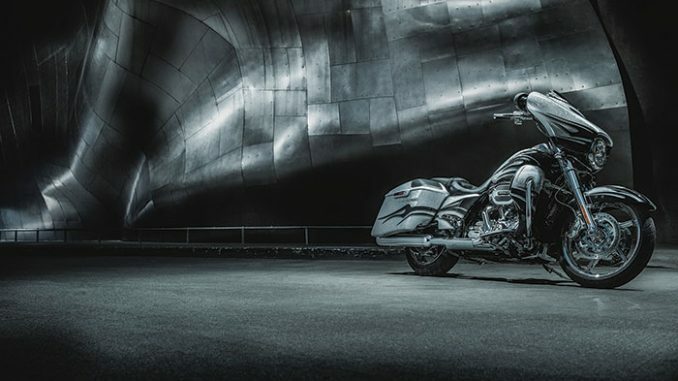 You roll in style on the CVO™ Street Glide® motorcycle. You’ve got 5-spoke polished chrome Aggressor wheels front and back with matching 5-spoke floating front rotors. And the cut back front fender exposes all of it to the world. Custom Vehicle Operations™ are about big engines, big paint and big wheels. As you can see, this one has the wheels covered in spades. A premium gloss black finish comes standard on the inner fairing of the CVO™ Street Glide® motorcycle. It has raised black-faced stadium style gauges, a lighted tic band, and an electronic speedometer with a spun aluminum finish. All there because on a bike like this one, you can’t help but go the extra mile. Check out the custom, low profile seat on the CVO™ Street Glide® motorcycle. Note the leather inserts and custom stitching on the seat. Craftsmanship like this is getting harder to find in the world today, but as long as we’re making CVO motorcycles, you’ll know where to look. 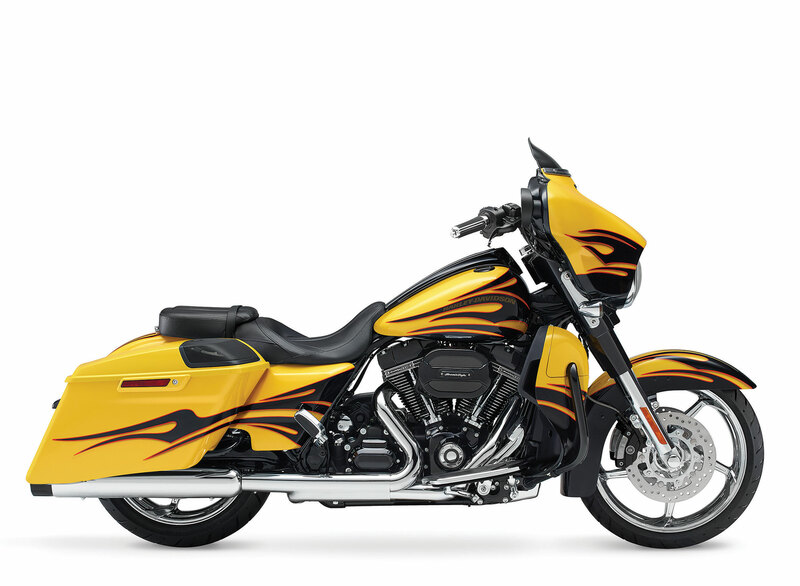 Notice how tight the front fender on the CVO™ Street Glide® motorcycle rides to the front wheel? A rubber-hugging fender like this never goes out of style. Notice the clean, no-nonsense lines of the rear fascia. Mounted inside, there are LED brake and rear turn signals. They not only give the CVO™ Street Glide® motorcycle a modern custom finish, they blast out light that’s hard for the driver behind you to ignore. 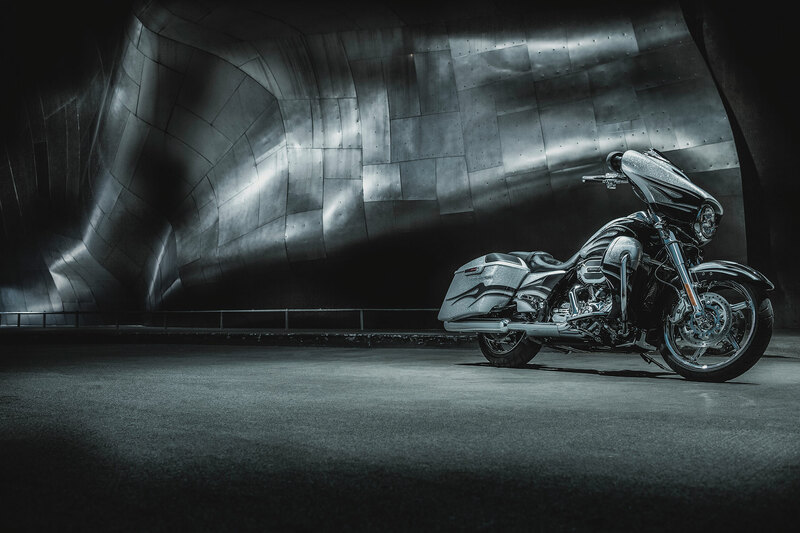 Put your eye to the inner fairing of the CVO™ Street Glide® motorcycle. There’s a bigger display screen (see the whole story in the infotainment section). Check out the gauges. You’ll notice a 10 percent larger viewing area, with wider, taller numbers sitting on top of that classic black background. The information gets bigger and better too. There’s a gear indicator for all six gears and the display area, which can now be operated by an extremely convenient trigger switch, puts more information at your fingertips. The temperature and fuel gauge are larger too. When you’re on the road, one quick glance tells you everything you need to know. It wouldn’t be a Harley-Davidson® motorcycle if we didn’t sweat the details. Note the color-matched fairing skirt on the CVO™ Street Glide® motorcycle this year. You also get a matching upper fork, slider cover and license plate cover. It’s that little bit of extra attention in the design studio that gets a little bit of extra respect on the street. Seat Height, Unladen 7 27.2 in. Weight, As Shipped 836 lb. Weight, In Running Order 870 lb.